Most sizes are silicone coated aside from extra thick CB type. See individual item page to confirm silicone or not. 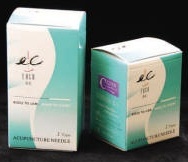 EACU (Easy to use, Easy to cure) offers a needle comparable to a Seirin. 38 gauge x 1/4 inch - NO GUIDE TUBE!